The standard “language” for ZigBee, WiFi and HomePlug still isn’t as feature-rich as today’s one-way proprietary systems. SEP 2.0 should take care of that—but when? Smart Energy Profile 1.0, 1.x, and 2.0 -- what’s the difference, anyway? A lot, it turns out. As a new communications standard being developed to run over low-power ZigBee wireless, ubiquitous Wi-Fi and the data-over-wiring HomePlug standards, SEP is if nothing else a work in progress. Indeed, while almost every smart meter in North America has a built-in ZigBee radio capable of communicating the SEP standard, relatively few have those radios “turned on” for in-home communications. Texas utility CenterPoint Energy has about 2 million or so Houston-area smart meters that can support ZigBee SEP 1.0, for example, but smart meter vendor Itron says that only about 6,000 in-home devices were hooked up as of this summer. In the meantime, there’s a decades-old version of a semi-smart thermostat, shall we say, made by Honeywell, Carrier, Eaton/Cooper Power, United Technologies, et. al. These use pager networks, FM radio data channels, text messaging and other one-way, broadcast-style technologies to control household power loads in hundreds of thousands of homes around the country. Honeywell, which has some sort of thermostat or energy control in about 150 million homes around the world, also has a line of programmable controllable thermostats, including its latest UtilityPRO thermostats, capable of two-way ZigBee communication, with some 400,000 units deployed as of early this year. Why hasn’t the “smarter,” two-way communication channel taken off? Beyond the fact that it’s a brand new technology, it’s important to remember that today’s one-way, broadcast proprietary communications may well be more functional than SEP 1.x, -- a term for versions of the standard available from the ZigBee Alliance today in 1.0 and 1.1 versions, along with add-ons. Take Honeywell’s newest UtilityPRO deployment in Canada’s Ontario province, where it’s connecting 60,000 homes in a demand response network for three utilities -- Burlington Hydro, Hydro Ottawa and PowerStream. Customers of these utilities have had a smart meter since about 2010 or so, as have about 4.6 million Ontario residents, as part of a province-wide mandate. But only about half of those meters came with ZigBee radios, a drawback to a rollout process that included several dozen smaller local utilities making independent decisions. That means that many of Honeywell’s new thermostats are going to be controlled by paging broadcast technology, rather than two-way ZigBee, according to Nisa Bradley, channel marketing manager for Honeywell Smart Grid Solutions. That allows Honeywell to reach all utility customers, not just those with ZigBee-enabled smart meters. But beyond that, today’s one-way technology offers more flexibility and features to engage end users than one would expect. This includes giving homeowners the ability to change a set point or schedule remotely from a Web or mobile interface, Bradley said. “You can do more with paging than you might think,” she said. In comparison, an open standard like SEP 1.1 has a “pretty specific vocabulary” of functions, but with the added benefit of being able to broadcast premise-specific messages, she said. That makes sense, of course. Proprietary systems will have more feature sets, taken in aggregate, than a single standard being forced to fit the capabilities and limitations of three different technologies. At the same time, technologies aimed at satisfying a specific customers' unique needs will be very different than a standard meant to encompass the needs of a broad cross-section of the smart grid industry. But Bradley's points underscore an understanding in the industry, which is that SEP 1.0 needs to be updated -- and SEP 2.0 is the answer. That’s the term for the next version of the standard, which is completely compatible between ZigBee, WiFi and HomePlug. The SEP 2.0 development process has been fraught with friction and delays, however, with delivery pushed back to late this year or early next. The WiFi and ZigBee alliances in particular have sparred over issues stemming from differences in their networking architectures that could negatively impact one or the others’ performance. Even so, we’ve seen several disputes resolved over the past 18 months, and the Consortium for Smart Energy Profile 2 Interoperability, the tripartite group organizing the standards work, recently incorporated, giving it a clear path to outlive the federal standards-setting process that led to its creation. At the same time, given that billions of dollars in stimulus grants were tied to promises to meet developing standards like these, pretty much every utility in the United States now says that whatever it’s doing in the utility-to-home area network (HAN) technology field is SEP-compliant. But right now, that means SEP 1.0, or 1.x, and while we’ve seen all three work together at interoperability fests and the like, we haven’t yet seen much in the way of real-world integration. 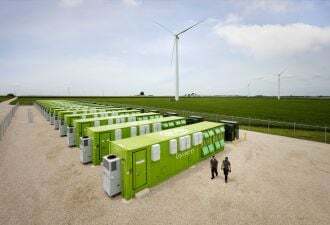 Some in the smart grid industry are worried that today’s SEP 1.x systems will have trouble upgrading to SE 2.0 when it rolls out over the next couple of years. Indeed, big utilities like California’s Pacific Gas & Electric insist they want to wait until SEP 2.0 is commercially available before they go full-bore into connecting smart meters to home area networks. That stance has caused some friction with the California Public Utilities Commission, which has ordered PG&E, Southern California Edison and San Diego Gas & Electric to start work on HAN rollouts in the next few years. CPUC has also ordered these IOUs to agree on a common set of data sharing standards and make that data available to their customers, whether via in-home display, web interface or text message alert system, to name a few options. While those two processes are moving along on different tracks (OpenADE, or automated data exchange, is the term for the data standard), they’re bound to link up at some point. Just because pager and radio networks are ubiquitous doesn’t mean that Honeywell and other incumbents in the field don’t want two-way communications, of course. First of all, ZigBee-connected thermostats can tell the utility what it’s doing and how much energy it’s saving, a key factor in turning household energy saving from a virtue into a verifiable, money-saving action. Secondly, “When you are using a ZigBee-enabled UtilityPRO, making it a two-way thermostat, one of the things that happens is premise-specific messaging,” Bradley said. That can lead to everything from targeting homes sharing the same feeder lines for pinpoint load control and grid balancing, to custom-tailoring each customers’ billing options based on profile data points like size of family, or interest in efficiency coupons, etc. While smart meters were once considered to lead the charge into homes, however, it now looks like broadband is taking the lead. 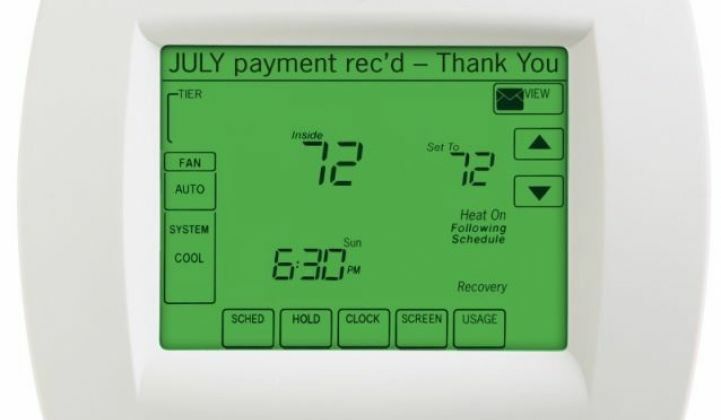 Utilities in deregulated markets like Texas and parts of the East Coast, which see smart thermostats as both an efficiency tool and a neat feature to attract and retain customers, have deployed various web and mobile interfaces to connect customers to their heating and cooling. Meanwhile, telecommunications and big-box retail giants like Verizon, AT&T, Comcast, Time Warner Cable, Lowe’s and Best Buy are adding smart thermostats and remote-control wall plugs to their home security and automation offerings. All of these different technologies will have to converge at some point, if we’re going to see utilities capture their various smart grid capabilities. In the long run, however, it isn’t technology holding utilities back, but economic and policy issues. First of all, you’ve got to reassure paranoid customers that you aren’t invading their privacy or charging them too much. Then, you’ve got to find a way to save enough energy -- or deliver enough add-on value, somehow -- to make the technology and customer outreach effort worth its cost.